We use some pretty standard terminology, which we summarize here. Our cube is made of 26 small cubies. The cube is solved when the colors on the 8 corner cubies and the 12 edge cubies match the color of the central cubies. We also call a single cubie solved if it is in the right position with the right orientation as required for solving the big cube. 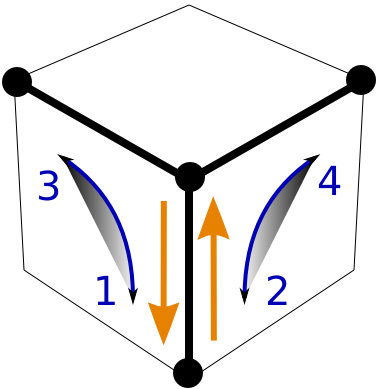 The cubies are moved relative to each other by turning one of the layers of the cubes by 90 degrees while holding the other two layers fixed. We call such a quarter-turn an elementary move or basic move. We denote face turns by F (front), R (right), L (left), B (back), U (up), and D (down). These are clockwise when looking down on the face. For the counter-clockwise, inverse move we write Fi etc. If we rotate the entire cube and not just one face, we write rF, rFi etc. 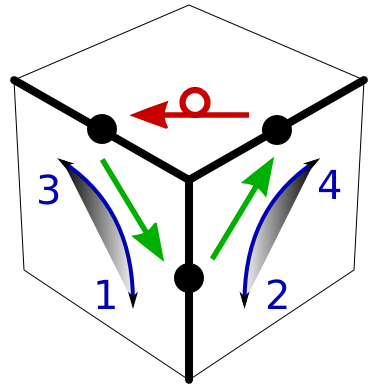 Although the cube did not change, an elementary move like R can now affect a different face. Doing the move F twice can be written as F F = F2 or 2*F. For elementary moves, 2*F = 2*Fi, 3*F = Fi, 4*F = I, the identity. A sequence of moves written like F R U means to first turn F, then R, then U. Its inverse is Ui Ri Fi. We have to reverse the order so that FRU UiRiFi is the identity. Given two moves A and B, we call A B Ai a conjugate move. Do A, then B, then do A in reverse. A conjugate is a typical prepare, work, restore operation. There also is B A Bi, which in general is a different conjugate. Given two moves A and B, we call A B Ai Bi a commutator move. We do A B, then Ai Bi, but note that Ai Bi is not the inverse (which would be Bi Ai). Basically, we undo A B except those pieces where the order of moves matters. The Y-move defined below corresponds to the elementary commutator A Bi Ai B.
Conjugates and commutators have some nice properties, in particular they tend to localize/minimize the "side-effects" of moves. (C) 2009, 2014, 2018 Bernd Bruegmann. All rights reserved.